Today, June 12, we commemorate Philippine Independence Day. While June 12 is officially a non-working holiday, our president declared yesterday the holiday and declared today a work day, supposedly to save Filipinos the trouble of going to work on a Monday (yesterday) after the usual no work week-end (Sunday and Saturday, that is) only to not work again on a Tuesday (today). That's rather acceptable. Only trouble is, the commemoration rites is still celebrated today (when people are supposedly at work) which meant closing down some parts of the otherwise busy Roxas Boulevard (causing horrendous traffic much to the consternation of the working public that has to ply that route). Anyway, let's leave the politics to the other blogs and celebrate this "working" holiday with another Filipino delicacy- the Puto Bumbong. 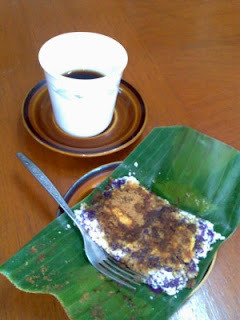 This violet-colored native delicacy is made from glutinous rice (malagkit) and served with butter or margarine, shredded mature coconut (niyog), and muscovado sugar. Puto bumbong reaches its height of popularity during Christmas season especially during Simbang Gabi (evening mass) where you can find vendors selling freshly made Puto Bumbong along with Bibingka around church areas. The beauty of working in a "semi-rural" area is that I get to have native delicacies including puto bumbong for merienda (afternoon snack) all year round (Puto Bumbong goes wonderfully with my black Barako brewed coffee). If you are not as fortunate as I am, you can always make your own. Just follow the recipe of Puto Bumbong from Filipino Vegetarian Recipe.com.